Rendang is one of the most flavorful curries in the world. If you're a curry fan, it's a must-try. 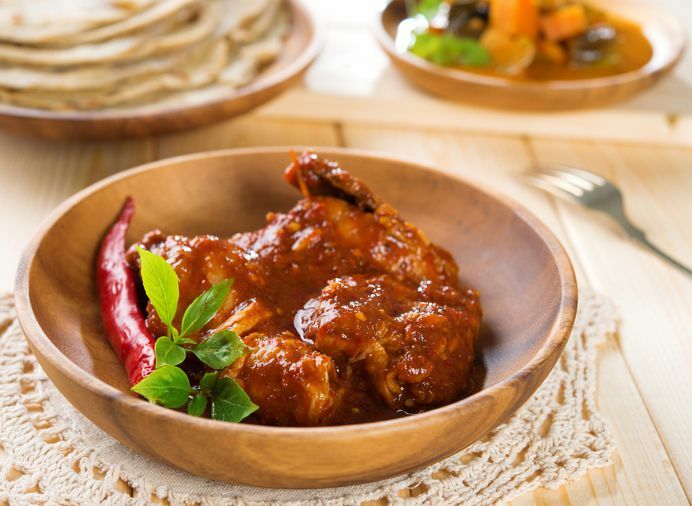 Rendang has its roots in Indonesian/Malaysian cuisine but is also popular in Thailand, Singapore, Vietnam, Burma, Sri Lanka, and other Asian countries. This authentic recipe turns out tender and simply inundated with taste. It comes courtesy of my husband's family (with roots in Malaysia & Thailand) who have shared with me not only the spice paste but also their secret for making the beef tender. This is one of our all-time favorite dishes and nowadays my husband is the one making it (and he is by no means an experienced cook! ), which tells you how simple it is. Yes, the ingredients list is long, but the steps are easy to follow and well worth the effort. Soon you'll be enjoying a sumptuous curry dish that we've found to be as good as any restaurant rendang, maybe even better. Hope you love it as much as we do. Place whole piece(s) of beef in a pot and cover with stock. Set over high heat and bring to a boil. Reduce heat to medium-low and cover. Simmer 30 to 45 minutes (this step makes for tender rendang as opposed to tough or rubbery). Meanwhile, place all 'Rendang Paste' ingredients together in a food processor or large chopper or blender. Process well to create a dark, very fragrant curry paste (if using a blender, add half the coconut milk at this stage to help blend ingredients). When beef is done simmering (it should be starting to feel tender when pierced with a fork), remove from the stock and cut into bite-size chunks or strips. Reserve 1/2 cup of the stock for cooking the curry and discard the rest (or use for other recipes). Place cut beef into a wok or large frying pan. Add paste and stir to coat the beef. Set over medium-high heat. When paste starts to sizzle, add reserved stock (1/2 cup) and coconut milk. Stir and bring to a boil. Reduce head to medium-low, until you get a gentle simmer. Cover and cook 30 minutes or longer, stirring every 5 minutes or so, until you're happy with the tenderness of the beef. Tip: Rendang is a 'drier' kind of curry, which means the spices really stick to the meat and there isn't a lot of sauce. If you'd prefer more sauce, you can add more coconut milk - just be sure to add more fish sauce as well to keep the intense flavor of the dish. Taste-test the rendang, adding more fish sauce if not salty-flavorful enough, or more tamarind or lime juice if too salty for your taste. Top with fresh coriander or lime leaves, and serve with Thai jasmine rice, or my Easy Thai Coconut Rice. Enjoy!